Among the tariffs that Canada imposed in retaliation to US tariffs on Canadian steel and aluminum is a 10% tariff on playing cards. Canada imported $69 million worth of playing cards in 2017, with the US responsible for $56 million, or just over 80%. While the tariff will not have as significant an impact on the cost of an average deck of cards compared to more expensive products like motor vehicles that are also targeted, the inclusion of playing cards seems to be of a more strategic play. At first glance, it seems odd that Canada would include playing cards on their list of retaliatory tariffs without also including other forms of entertainment like board games. After all, the US is also a notable source of imports of other entertainment media. However, the picture becomes clearer once you note that US Playing Card Company, the largest producer of playing cards in the US, is headquartered in Kentucky - the home state of Mitch McConnell, the Republican Senate Majority Leader. As a retaliatory move, the Canadian playing card tariffs are symbolic rather than functional. US Playing Card Company sells playing cards under a diverse range of brands, some of which are sold in retail stores, while others are made exclusively for use in casinos. Because of this, retailers and casinos are likely to bear the majority of a cost increase the tariff would cause, although they could offset the tariff by increasing the price of food and beverages purchased on site. Alternatively, Canadian businesses could game the system by sourcing playing cards from other nations. China and Japan were the next two leading sources of playing card imports in 2017 and although both nations are dwarfed by imports from the US, suppliers could increase their purchases from China and Japan to avoid paying the tariff. However, not all types of playing cards have the luxury of being sourced from a country that isn’t the US. Popular trading card games such as Magic: The Gathering and Pokémon, which also fall under the tariff, are manufactured in the US and imported to Canada. With no readily available alternative source of imports, retailers that stock these games will be forced to either eat the added cost of the tariff or pass some or all of the cost on to the consumers. Because these games are primarily played by younger consumers with lower levels of disposable income, many may hit pause on their card collecting because of the tariffs, driving down sales. 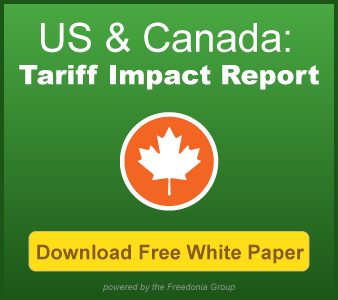 Want to learn more about dueling tariffs and the industries they'll impact the most? Download the Freedonia Group's new white paper for the latest insights from experts. Kyle Peters is the Manager of the Machinery and Equipment Group at The Freedonia Group, where he works on studies related to the US and global machinery, appliances, and industrial components markets.